Do not settle for another me-too design from the 50's! Our success has been based on two key concepts - innovation and transparency. 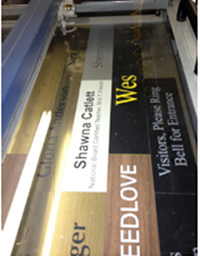 Our innovations have shaken up the stodgy engraved sign, name plate and name badge industry. Yes, our factory makes hundreds (if not thousands) of signs, badges and nameplates each day. With dozens of presses ranging from our digital, full color presses to our laser engravers, we handle a wide array of engraving projects. But, our success is measured through a number of customer-focused innovations. Engraved sign orders are shipped in a single day. Our web site offers a complete range of signs, not just a few nameplates. All can be designed online. Our full-color signs and plates give you design freedom that makes your sign or identity project stand out. Design for the 21st century – do not accept another boring design from a generic superstore. We offer a plethora of typesets, font styles, alignments, graphics and layouts. Give us a call to request a proof from our distinguished graphic artists who work hand in hand with our Customer Service Team to create the design you envision. Our “fair deal” pricing leads the industry. We reject the loss-leader philosophy that advertises a low price – but rakes it all in with extravagant shipping and handling fees. Shipping charges for orders under $25 are only $5.99. Shipping on orders over $25 is free. We do not charge extra for more lines of text or longer legends. Our prices are fair and our process is transparent. For example, use our site to track orders as they move through our factory and onto the USPS, UPS or FedEx truck. There are no hidden design or proofing fees. Please call me for help. Our skilled engravers love their craft. Find out why thousands of our loyal customers order from us again and again.